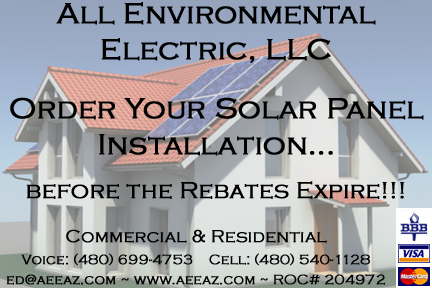 AEE, LLC offers complete Solar Power Systems, design and installation for those customers that would like to take advantage of the incentives and rebates that are being offered right now through the Government and Utility Companies. We review, your current monthly electrical usage, discuss other ways to reduce power consumption, design a solar power system based upon your budget and show you how much savings you could receive from solar power. Give us a call or e-mail us at ed@aeeaz.com and we will spend some time with you to set up a feasibility study. Our professional installation will have you resting assured that your home solar panels will give you a long life of service with trouble free maintenance. Make the decision to take advantage of the Sun to provide you with “Clean Energy!”Saving money for our customers is our goal, as well as, safe reliable electrical installations. AEE offers Commercial Energy efficiency solutions. We are the area Manufacturers Representative for “POWERKURE,” a product which corrects up to twelve power quality problems, including Power Factor correction for your business. Please ask about “POWERKUREUSA” and learn more! AEE, LLC has earned a “Certificate of Safety” for having a perfect safety record. AEE located in Scottsdale, Arizona serves all of Arizona with consideration to our client’s specific needs. 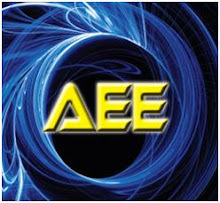 AEE, LLC encourages “Energy Efficiency!” In giving economically, sound efficient energy to our customers, as well as, keeping environmentally friendly. In your home we can install compact fluorescent lighting, LED lighting, and if the customer prefers incandescent lighting, we have a solution – Installing ECO dimmer switches to reduce wasted energy, extend bulb life and at the same time, provide, at your convenience, a more pleasing ambiance. We Install Complete Solar Systems!